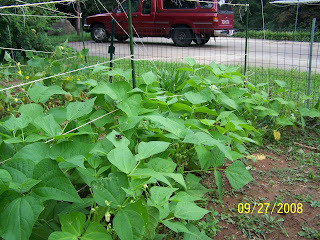 About 10 days ago, Tom created some vertical lift for the cucumbers, beans and squash. This will make it easier to harvest the vegetables and will take up less space as they grow up instead of laying on the ground (at least, that's the theory). 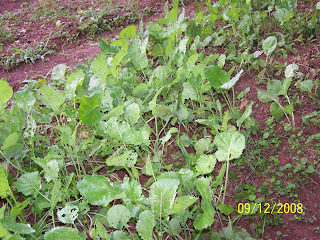 Collards: We thinned them out yet again. This time the leaves are big enough to eat (see end of post). 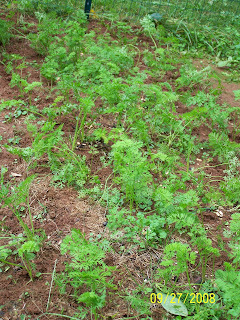 Carrots: Tom did a great job of spreading out the sprouts so more of them will mature. 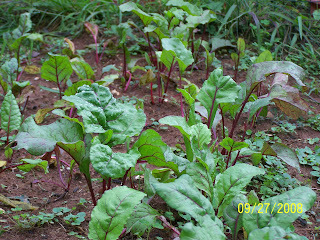 Swiss Chard: Coming along, but not as many plants as we would have liked. Looks like we've managed to stop bugs from eating it long enough for it to grow. 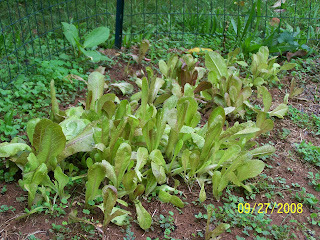 Lettuce: This is also coming along. In fact I may make the first salad sometime this week. 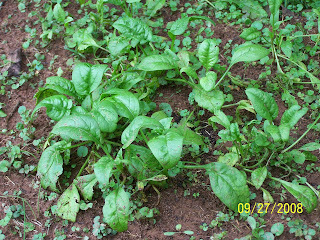 Spinach: Slow in coming. Not going to get as much of a harvest as I would like. 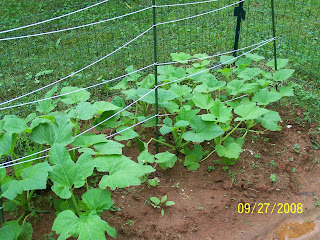 Squash: Growing like crazy. Flowers just starting to come, but not fully blooming yet. Broccoli: I'm still perplexed by this. It's growing. It's producing leaves. But there still isn't anything resembling a flower or pod or anything close to broccoli. I suspect this is all that's going to happen here. 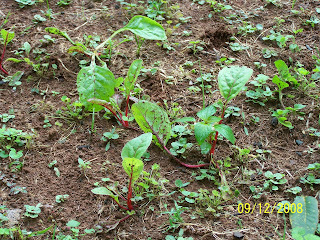 Beets: Now these guys are doing GREAT. 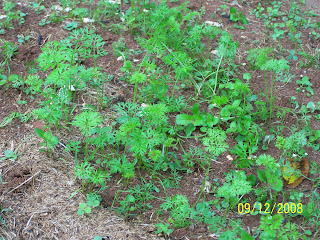 Tom spread out the sprouts like he did with the carrots and they are flourishing. ...it's producing beans! Pulled off the first batch to cook this weekend! Very exciting! 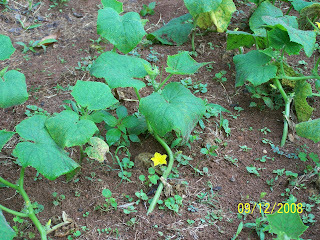 Cucumbers: I keep talking to these plants, asking them when they're going to quit flowering and actually produce a cucumber. I have hope. Guess I'll have to be more patient. 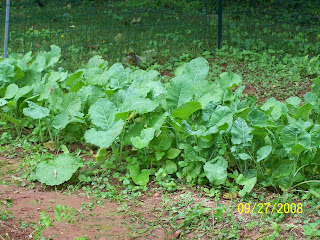 As mentioned earlier, we thinned the collards and are going to eat a batch today. In fact, Tom is cooking them up as I type this. Here is what I harvested. 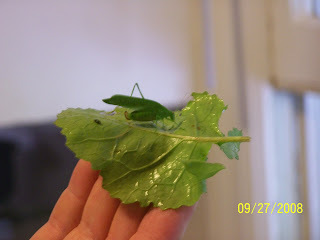 What we will NOT be cooking is the non-edible green bug that accompanied the collards into the kitchen. Eek! Tom did his husbandly duties and escorted it outside. IF you look close, you can see the batch of eggs the bug left on the leaves. Tom saw these eggs previously on the collard sprouts and thought snails or beetles or mites were doing this. Turns out it was these living leaf-things. Eek! 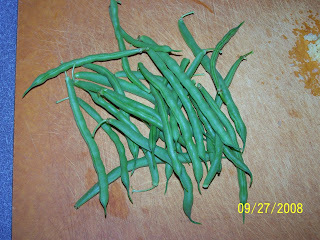 And here is the first harvest of Blue Lake green beans. I'll be cooking these up with some tomatoes and garlic tomorrow. I ate one in the garden and loved the fresh taste. I gave one to Tom, who chewed, spit it out and made a face. 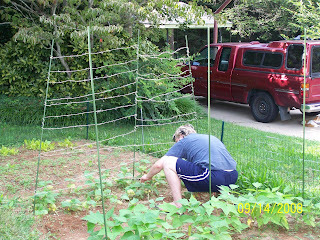 I accused him of not being a real gardener for not liking uncooked green beans. Pfah! 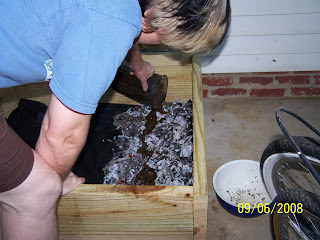 I began my foray into vermicomposting last weekend. 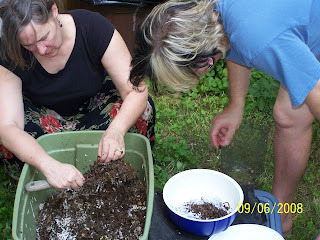 Thanks to our dear friend Phyllis, an avid vermicomposter, I got a starter set of worms. Given the size of the box and the amount of kitchen and lawn wastes we produce, I need to go to a bait and tackle store and grab some more red wigglers. I started my worm box by shredding our white, non-glossy junk mail (after taking out the plastic envelope windows) and some Creative Loafings. I soaked the shredded paper, wrung it out and put it down on top of a black landscaping cloth. Then I put down the red wigglers that Phyllis so generously gave us. Then I put our week's worth of kitchen scraps into a blender, and poured the smelly mixture on top of the worms. Then I topped with a heaping layer of wet shredded paper and newsprint. I topped with the black landscaping cloth, to help keep out the insects (though that's a losing cause since I'm creating an entire eco-system). Sure, flies galore abounded in the first few days. However it didn't smell one bit. I did freak out when I saw how many fruit flies there were, so I took our mosquito mist spray, lifted the lid and did a quick spray in the mostly empty box, then sprayed all outside. It seemed to help, but in retrospect I realized it was a boneheaded move. Luckily, a few days later I checked the worms, and they were doing fine thanks to the coverings on top and had made a good amount of casings already. The shredded paper on top was still moist. A white furry "thing" had begun to grow on top of the black landscaping cloth and the top layer. There also were maggots growing in the food mix. Phyllis tells me that flies are no worry (but grub worms are another matter). I'll heed her advice and not do any more lethal spraying, just let it be. Now the carport has a faint smell of earth, no kidding. Nice dirt smell, and it's faint. The worms are working their magic. I'll give them another weekly feeding of blended kitchen scraps and a new topping of paper. I'll put this on top of what's already there, since they'll surf the line I've started and go to the top where the new food is. It's pretty amazing to watch nature at work. 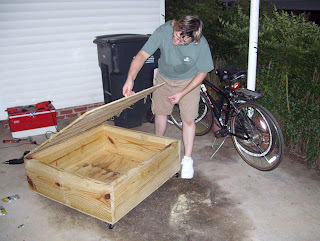 I also am very glad that I put a ton of ventilation holes in the bottom and all sides, that my worm box is so large that I can compost in lines across the box, that it's on casters which raises it above grub-worm and invading ant level on the carport, and that it has a handy-dandy lid on hinges with a handle. I think I did pretty well starting out. Go, worms! It's been four weeks from the time we planted seeds. Some plants are doing well, others are struggling, and still others are getting eaten by something or other. Unless Tom is snacking when I'm not looking, we have some pests to tend to. I went to the library and checked out two books and a DVD by master gardener Jerry Baker. He uses pesticides and fertilizers that you make from common items in your home. One pesticide Tom used the other day consisted of dish soap and tobacco juice. Strange mixtures, but if they work, we're happy. Here's a rundown of what's happening in TYs Garden today. 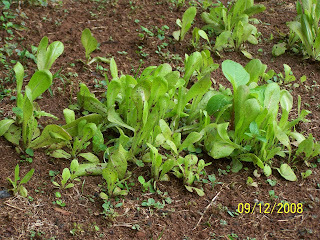 Lettuce: Very clumped together but finally doing well. I spread out a few of the shoots, but it doesn't look like they re-rooted well. I won't try moving any more until the roots become more developed. Cucumbers: These guys are rockin'! Some leaves started turning yellow/brown. I suspected it was due to lack of water. After a few waterings and a good rain they perked right up. 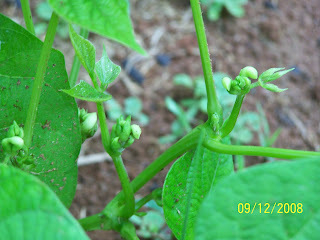 AND they've started to blossom (see the flower) which means cucumbers are on the way! 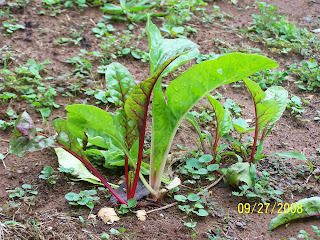 Swiss Chard: Struggling, struggling, struggling. These guys seem to be getting eaten before they get a running start. Many seeds came up, but they were soon gone. Going to do our best to keep the few that are growing alive and flourishing. Spinach: At least I think there's spinach in there. 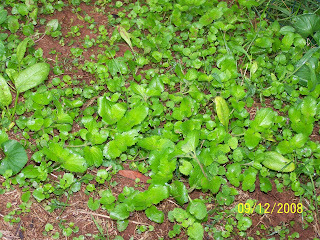 A lot of what you see is clover and weeds. I'm having a difficult time distinguishing the spinach from the clover. I'll likely leave this alone for a while until the spinach becomes more recognizable. 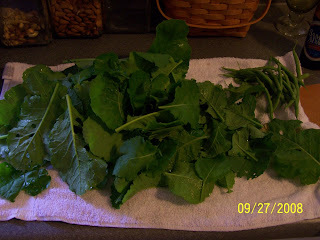 Collards: These havd taken off like nobody's business! Tom has thinned out this bed twice! He has also sprayed with the Jerry Baker pesticide formula, but as you see, something is still munching on it. We'll need to re-spray this weekend. Carrots: No problem telling what's what here. Those bushy tops are pretty distinct. And no problems with bugs thus far. 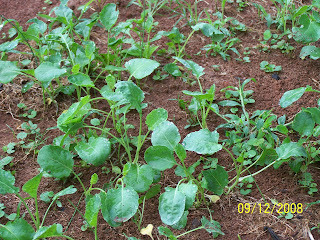 Broccoli: This bed is doing well. 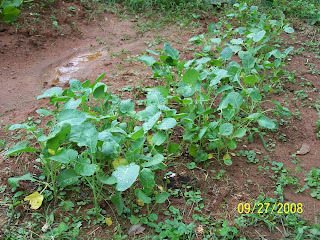 Still can't picture how these will turn into broccoli... and not sure how/when to thin them either. Playing the "watch and see" game with the broc. 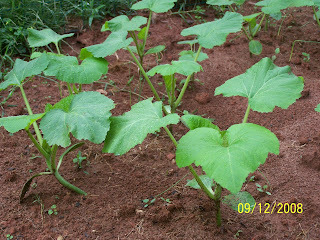 Squash: These seeds were planted a full two weeks after everything else. They were not going to be the runt of the garden, no way, no how! I suspect we're going to be eating squash casserole, squash salad, squash pie, squash omelets, squash bread, squash stir fry, squash smoothies, etc. 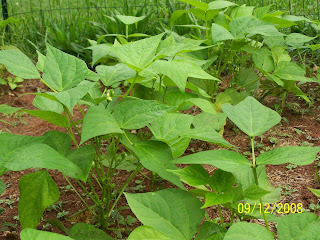 Blue Lake Beans (green beans): Well what can I say about the beans? They are doing great! We'll be shopping for a few trellises (or is it trelli?) 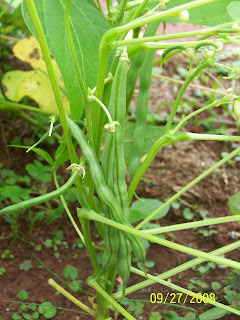 this weekend so the beans can grow vertically. That way we'll be able to get more from each plant. 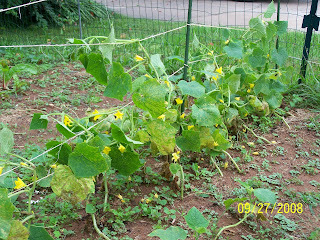 These, like the cucumbers, are starting to flower (see next photo). 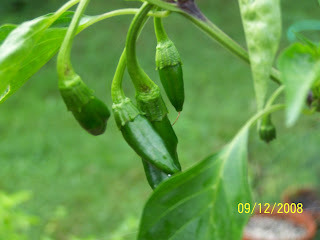 These are some peppers I started in containers back in May. Not part of the big garden... but vegetables nonetheless. A few weeks ago I made salsa with them. Wish they had more heat, but they do have a strong pepper flavor. "Scotty, give me all the compost you can muster, mister!" my inner Capt. Kirk voice has been telling me. 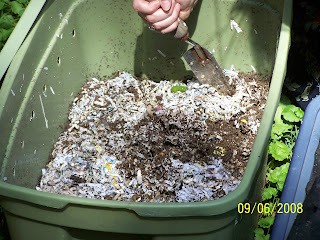 So I researched and researched different composting methods and options. Boy, can making rich dirt be expensive ... and labor intensive (gotta turn that soil-in-training in order to let it cook ... can't have too much carbon to nitrogen, just the right mix, gotta keep the critters away). Okay, let's be realistic; with everything else we've got going on, turning the veggie scraps pile just isn't gonna rate high on our list of to-do's. So, I opted for the best method for the small gardener looking to have no labor involved. Yep, it's time to bring in the worms. Vermicomposting is the answer for us. My Uncle Jim used to use worms in his compost pile, and he gardened in beds too as I remember. Both of which combined for a gang-busters garden. Also he always had a ready supply of fish bait. I feel like I've been channeling my Unc' Jim to a degree. EDITOR'S NOTE: Yvonne has, for the record, proclaimed that she will have nothing to do with the feeding, comfort, moving around and/or harvesting of worms or vermicompost from this day forward. 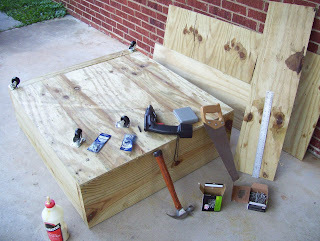 So I made a "worm box" as I call it. I opted for pressure-treated pine boards and panelling, and made a 3-foot by 3-foot box. Yvonne suggested I use casters, which I thought was just a brilliant idea. And, she also suggested a handle for the top. I already knew we had to get hinges on the thing. Unfortunately for me, I had the fella at Home Depot cut the panelling at 3-feet square, thinking it'd match up to my 3-foot long sides. I forgot to add on 2 inches on either side because of the thickness of the side lumber. Doh! Anyway, I just used some more nails, some twine as clamps and lots of wood glue, along with a little saw, to rip out the perfect length pieces out of my leftover scrap and put the bottom and top extensions into place. And man, can I drive some nails. I actually got really good at driving 3-inch nails in all the way in only three whacks (or less!). 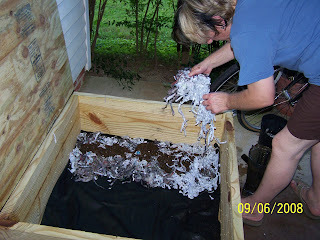 I'm planning on using shredded newspaper for bedding, and to utilize the "migration method" to harvest my compost worm-free. Basically you lay a bed on one side, feed the worms on that one side, and when they've broken it down all good and rich, lay a bed on the other side of the box and start feeding that side. 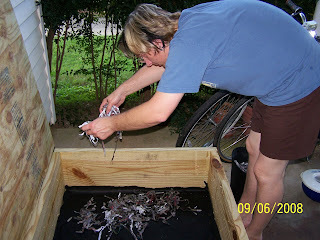 Eventually the worms will migrate over to the new side, leaving behind their rich composted castings. 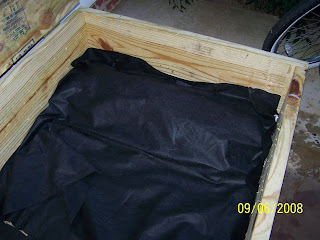 Hopefully this'll yield lots of black gold offa the tons of veggie scraps and yard waste Y & I generate. I'm pretty excited at the prospect of "nothing wasted". Garden, yard and kitchen wastes turned into black gold. We'll see.